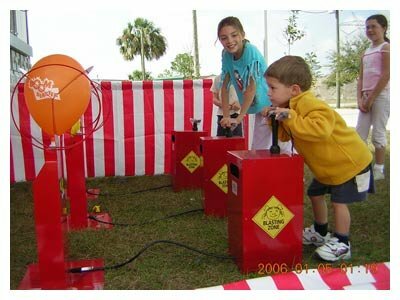 Boom Blasters combines the excitement of a balloon-popping contest with a safe, authentic-looking blasting detonator straight from the Saturday cartoons. Three players frantically pump, inflating their balloons until they reach the balloon-bursting arcs. First to burst – BOOM! – is the winner. (Small, well-labeled points help burst balloons when they reach air capacity). The game provides fabulous visual fun and excitement for all ages, indoors and out, year round.